One of the biggest challenges of a Moon colony is that of supply. As of now, astronauts have to carry everything they need from Earth, including food and clothing, but the dream is to be able to grow their own food and make their own clothing. Chinese scientists have taken one step closer to that dream...but not as big a step as they hoped. 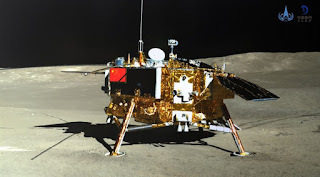 Last week, China landed the space probe Chang'e-4 on the far side of the Moon. It had a small canister that served as a miniature biosphere including water, soil, air, a heat control system and some specimens including cotton seeds, rapeseed, a potato, eggs of a fruit fly, and some yeast. The biosphere had two small cameras and a heat control system. 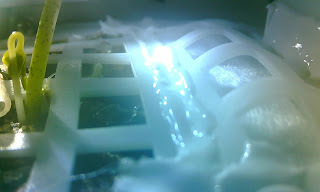 When the probe touched down, the seeds were watered, and a few days later, a cotton seed sprouted. First of all, just getting anything at all to grow on the surface of the Moon is an enormous achievement. It's also a major step in scientific research because if astronauts can grow plants on the Moon, it opens up the way to a self-sustaining colony. Instead of having to carry food, a colony could carry seeds and grow food, and even cotton to make clothing. Unfortunately, the experiment ended quickly when the plant died. Some were critical of China's claim that this was "the first green leaf growing on the moon in human history." As Melanie J. Correll (associate professor at the University of Florida's Agricultural and Biological Engineering Department) told NPR, "China has grown the first leaf in a specially designed chamber that was placed on the moon. [The] plants were not exposed to the extreme environments of the moon." But even with all that, the temperature on the Moon fluctuated so wildly that the plants were killed. In the sun, the temperature on the Moon can reach 260 degrees Fahrenheit (127 degrees Celsius), and minus 280 F (minus 173 C) in the shade. The miniature biosphere wasn't able to compensate for that. Still, it was a step in the right direction. Here's hoping for more. What did you think? Was this a boon or a bust? Let us know in the comments! What if Black Panther's Wakanda Were Real?